NEW INFO ON 2015 SDCC RAVENS EXCLUSIVES!! As you may already know, both the Four Horsemen and Action Figure Xpress will have exclusive variants of the Ravens figures for sale at the San Diego Comic Con. But what you didn’t know until now is that each of these items are going to come with some pretty cool previously unannounced accessories! 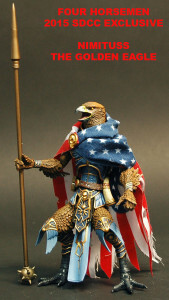 The Four Horsemen’s exclusive – Nimituss, the Golden Eagle – will not only be sporting those cool colors inspired by the traditional colors of the fatigues worn by the US Navy (since we’ll be right next door to the Naval Base in San Diego), but he’ll also come with the same amazing American flag cape that came with our previous patriotic release – Eagalus! The price for Nimituss, the Golden Eagle will be $35.00 each and will be available beginning on Preview Night at the 2015 San Diego Comic Con at the AFX booth #3345. No limits on amount purchased but they’ll be at the show in limited numbers, so don’t hesitate to get yours as quickly as possible. 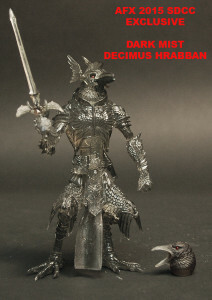 Action Figure Xpress’s exclusive – Dark Mist Decimus Hrabban – will not only be painted in a way that would exemplify his ability to transform into a foggy, ethereal entity in order to swiftly and stealthily stalk the catacombs of Gothitropolis without detection, but he’ll also come with a Dark Mist Battle Pack! Each Dark Mist Battle Pack includes a screaming Dark Mist Decimus Hrabban head, a Dark Mist battle helmet, and a Dark Mist saber! The price for Dark Mist Decimus Hrabban will be $35.00 each and will be available beginning on Preview Night at the 2015 San Diego Comic Con at the AFX booth #3345. No limits on amount purchased but they’ll be at the show in limited numbers, so don’t hesitate to get yours as quickly as possible.